So now, I am at a new juncture. I have plate solving working with All Sky plate solver. Never could get astrotortilla to work. Now, I would like to get a solution going so I don’t have to go out to the mount and use the hand controller to choose the next target. I guess I need some planetarium software. I do have starry night se. have no idea if it would work or not. It costs more than I want to spend to upgrade, if I even wanted to. I could not get it to work, I’ve only tried once though. Im not sure really which direction to go in. I’ve checked out Cartes du Ciel. I think CdC would do what I want. My current flow is using the asi224 is just starting SharpCap and connect it to the mount using POTH, polar align and then plate solve from inside SharpCap. I then go inside and connect to that laptop with another laptop using RDP. Using this method, I have to use the hand controller outside to do Goto’s. I want to be able to do that from inside. Should I be able to connect starry night and SharpCap to the POTH driver? I would also like to include guiding too. I think I would need another camera for guiding though. Is that correct? Anyway, I hope I’m not asking too much of all you knowledgeable people out there. I have asked many questions and i have been given great advice from all of you so far. I like CdCs ability to display multiple charts at once. I use it to show the telescope's FOV, the E-finder's FOV, and an alt-az Eyeball wide FOV all at once. No more zooming in and out, and depending on which window you drag you get coarse, medium, and fine adjustment. Works with ASCOM so it should be a shoo-in with POTH. So, CdC works with more than one camera at a time? I see thatCdC plays nice with PHD2. How does it work with plate solving? I haven’t been able to find out about that yet? Shoud I try out APT? It looks complicated. What mount? I use a combination of Stellarium on the PC and Sky Safari on the iPad to control my AZ GTi. My mount has wifi built in, so its pretty easy to control it with a variety of ways. I do have different planetarium programs tried and found Stellarium the most easy to use. Also has a bunch of objects to choose. It is possible to connect your mount with Stellarium and SharpCap via Ascom-POTH. To connect the mount with Stellarium it is best to use "StellariumScope". I don't use guiding but I think a separate guiding camera is needed. Although doing EAA with small exposure/integration times guiding isn't required. The mount I’m currently trying to get working is an AVX. I don’t want to involve an iPad in the mix. What my goal is eventually, is to have a computer at the mount controlled by another computer in the house. I have that basically now with the exception of gotos, I have to be at the hand controller. If I don’t need WiFi, I’d rather do without it, the exception of course, is the connection between the two computers. I have not considered stellarium yet, I will look into that software. The main thing I’m looking for is integration with the rest of what I’m using. I’m not afraid of scrapping what I’ve got so far and starting over. It does seem that most will work together to some degree. I’m not doing guiding so much now but may in the future. I want to be able to polar align and plate solve, since I’ve gotten that working I’m now spoiled. Why haven’t I already been doing this? I guess because I just started eaa. I’m considering getting another camera, but that’s another thread and even more questions. I use CdC in conjunction with SC Pro. I use the celestron ascom driver, not POTH. All work well together - I issue goto's in CdC,and plate solve if necessary. If I plate solve I sync CdC after SC moves the mount. I tried stellarium, but do not care for the interface. The one in CdC is decidedly old school, but can be made to show black on white, which I prefer. Plus, I seem to recall that stellarium is a resource hog. I tried connecting to the Celestron ascom driver. SharpCap did not not show the solve and sync controls for the mount this way, it was only after I connected via POTH it showed these controls. This is all an experiment, I will try it again. Right now, clears sky’s are scarce. Maybe there is an updated ascom driver for Celestron mounts I need to get. It’s been a few years since I installed all that stuff. I haven’t been using it until the last few months. It seems that you’re doing pretty much what I’m shooting for. I will try both stellarium and CdC. I will most likely try CdC first since it’s been recommended by more people. I think all will be happy together on the same computer. Does APT have role to play in this or is it just too complex? Looking at the documentation is a little overwhelming. Its takes awhile to learn all this stuff when you only have a few days a month to be at it. Soon here it will be the hot time of year. Thanks for the post and information. The link takes me to the top of this page. I did search and find the ascom update. I have been using 6.2. I didn’t know the Celestron driver was separate though. I found it too. It’s all installed and waiting for the next clear night. CdC is installed. It took me a minute or two before I figured out how to enter my location. Not too complicated, even for me. You all have been a great help so far, thank you! I use Cartes du Ciel because it is less resource on the computer as I use Sharpcap. Is it better than stellarium in that regard? Have you used them both? I have used Stellarium, but I think it is more resource intensive as it uses 3D graphics. Cartes du Ciel had simpler graphics, so it is less resource intensive. I am not going to say which is better. More of a preference. That makes sense, thanks. I’m going to try both and make a decision. I’m using older laptops, both are i7 CPU’s. They’re both 5 years old though. One has 24Gb of ram and an SSD, the other has 8Gb of ram and a spinner hard drive. It might make a difference, maybe not. Stellarium looks more complicated from the online documentation. 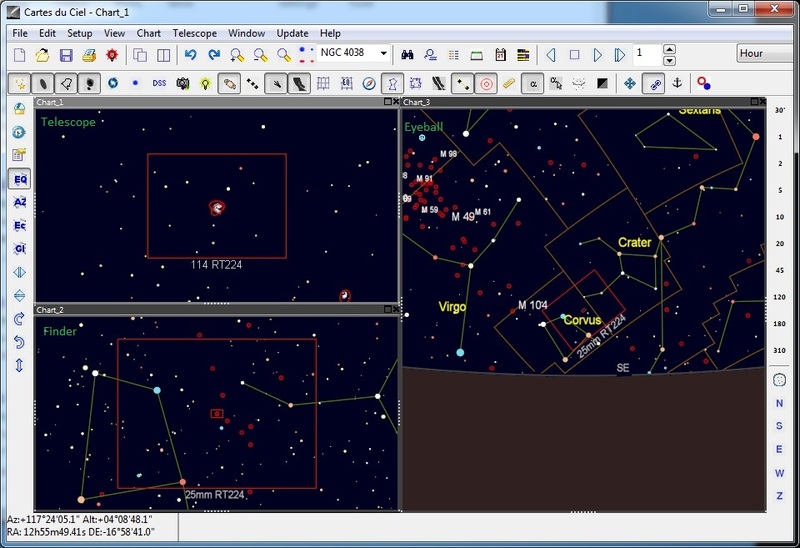 If using CDC and All Sky Plate Solver (as I do), you need to change the CDC chart epoch setting to Astrometry J2000. https://www.ap-i.net...art_coordinates This will get you close enough for most purposes, but it still wont be perfect because the two programs default to different star catalogs. One nice thing about CDC is that there are many additional (specialty) catalogs available. More things to think about, it’s never simple. As long as it’s doable I’m going to figure it out. Thanks for the link and heads up. At least now I know what to look out for. I need to amend my earlier post regarding plate solving epochs. After experimenting some more, I have come to realize that the problem is considerably more complicated and it typically can not be solved analytically because there two many unknowns. That is, there are 4 components involved (mount, alignment software, planetarium, and plate solver), each with an input and an output. And typically, the user does not know (conveniently) what epoch each of the inputs and outputs is charted in. For example, I had to resort to trial and error with my Onstep controlled mount. And the solution was that I had to set (mismatch) ASPS to Jnow and CDC to J2000. Or maybe it was the other way around. Hmmm. I don't recall without driving to my "observatory" to double check. But I do recall l that I was very relieved when it finally started working right. Anyway, the moral of the story is that you may have to do some trial and error to see what works. I had a strange event the other night. I slewed to an object with CdC, then, I plate solved. After the plate solve successfully went through it’s routine, when it went to realign the mount, the mount went crazy, I had to push the direction button on the hand controller to make it stop. After that, I had to realign. This is not making me comfortable for staying inside while my mount is outside where I can’t see it. The only time I have experienced something was when the object near the meridian, and the mount needed to move over the meridian. Depending on how you have things set up, the mount will either freeze or it will take off for home before heading to the object (on the opposite side of the meridian. Was the object near the meridian? It would have been either m82 or m51 at about 9:00p so it could have been fairly close.